Putco now has GM-licensed bowtie emblems available in black, chrome, and gunmetal for most 2007-2016 trucks and the 2010-2014 Camaro. Made of solid 304 stainless steel. Each kit includes front and rear emblems unless otherwise noted. Stainless steel hardware and 3M™ automotive tape included. Backed by Putco’s Lifetime NeveRust Warranty. 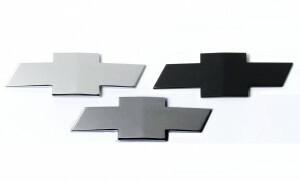 <p>Putco now has GM-licensed bowtie emblems available in black, chrome, and gunmetal for most 2007-2016 trucks and the 2010-2014 Camaro. 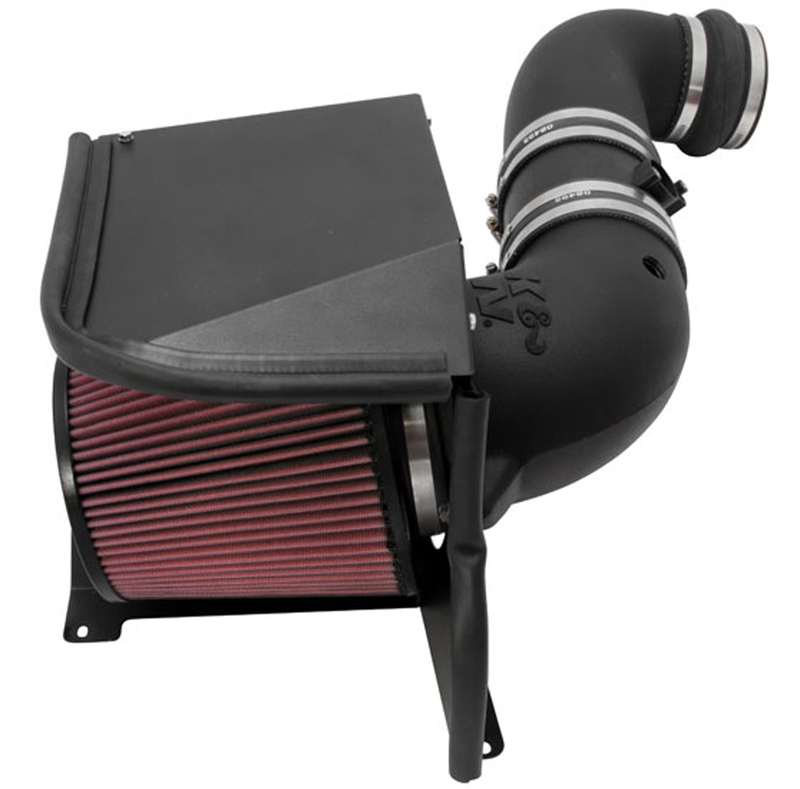 The K&N 57-3077 FIPK air intake system replaces the restrictive factory air filter and air intake housing in specific Chevrolet Silverado 2500/3500 HD and GMC Sierra 2500/3500 HD models with a turbo V8. K&N air intakes are designed to dramatically reduce intake restriction as they smooth and straighten air flow. This allows your engine to inhale a larger amount of air with less effort than the factory air filter assembly. More air means more usable power and acceleration throughout the engine’s RPM range. This air intake comes with a black rubber-topped K&N high-flow air filter and a heat shield that installs into the original air box space. Air is directed through an aerodynamically engineered intake tube into the engine’s turbo inlet for a guaranteed power gain. The tube accommodates the factory mass air sensor and air filter minder. The oversized cone-shaped air filter can be used for up to 100,000 miles before servicing is needed, depending on driving conditions. 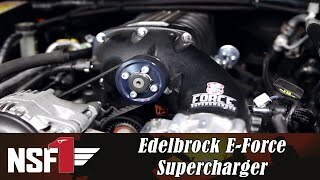 This air intake is relatively easy to install, usually in 90 minutes or less using existing factory mounting points. The tools needed are a couple of screwdrivers, a ratchet set, and an Allen wrench. 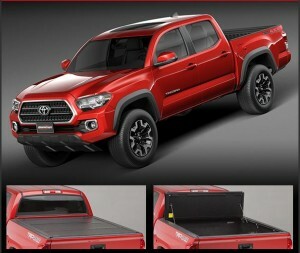 The UnderCover Flex is now available for the all-new 2016 Toyota Tacoma, with models for both the 5′ bed (FX41014) and the 6′ bed (FX41015). The UnderCover Flex is a hard folding tonneau cover that gives you ultimate control of your truck bed with three secure riding positions. The cover is easy to remove, requires no drilling for installation, and mounts flush with your truck’s bed rails–making it the most water-tight hard folding cover on the market. Each panel is made from quality FRP composite material, which is lighter, stronger, and more dent resistant than aluminum. Each Flex has a bed rail mounting system equipped with rubber seals and drain tubes that carry water away from and out of the bed, keeping your gear dry and secure. Best yet, Flex is backed by a 3-year warranty. 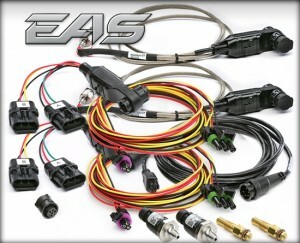 The EAS (Expandable Accessory System) allows you to connect and display multiple accessory sensors, daisy-chain style, to customize the CS2/CTS2 to your specific vehicle and needs. Don’t add clunky gauges when you can have the clean look of dozens of display parameters on a single device using Edge’s EAS. Edge Products’ 98618 EAS Data-Logging Kit is for the ultimate diesel enthusiast! This kit gives users the ability to monitor EGTs in two different locations, two 0-100 PSIg boost sensors, and two -40F to 300F temp sensors for unmatched monitoring. This kit is designed for truck owners who have upgraded turbos and other mods where the stock sensors just aren’t enough anymore. Truck owners who use trucks for dyno competitions, sled pulls, and drag racing need this kit. Fine tuning these trucks can be difficult, but with the Edge EAS Data-Logging Kit you can log runs, view logs, and make adjustments as needed for maximum performance. Southern California–based T-Rex Grilles might be a relative newcomer to Total Truck Centers, but the company has been pumping out cutting-edge grille designs for nearly two decades. With a variety of series to choose from—X-Metal, Torch LED, Graphic, and Billet, to name a few—T-Rex has a style to fit your aesthetic. 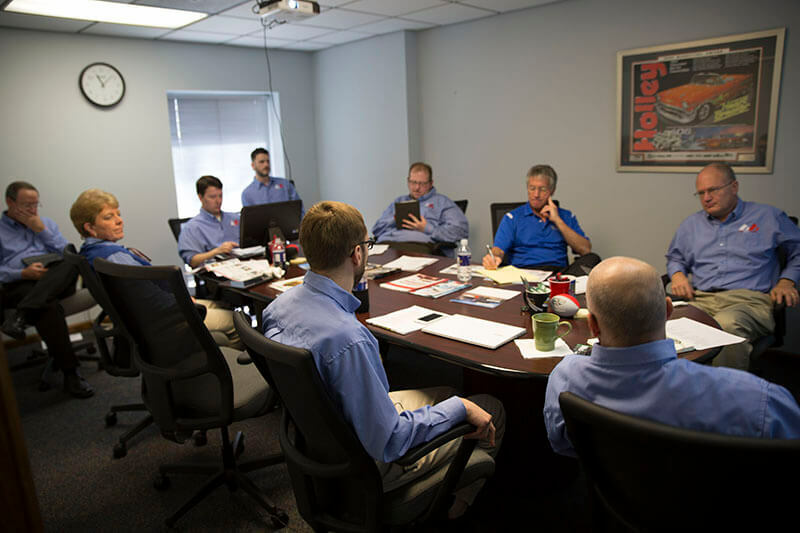 Last week Total Truck Centers had T-Rex National Sales Manager Tom Ameduri in the office to share ideas, swap stories, and build a more effective partnership. Tom learned about all the programs we’ve put together to support local jobbers, and we discovered a few things as well. Like when T-Rex says its products are made in America, they really mean it: everything, from materials and labor to manufacturing and shipping boxes, originates domestically. The company is also ramping up production with a faster, more efficient laser cutter. 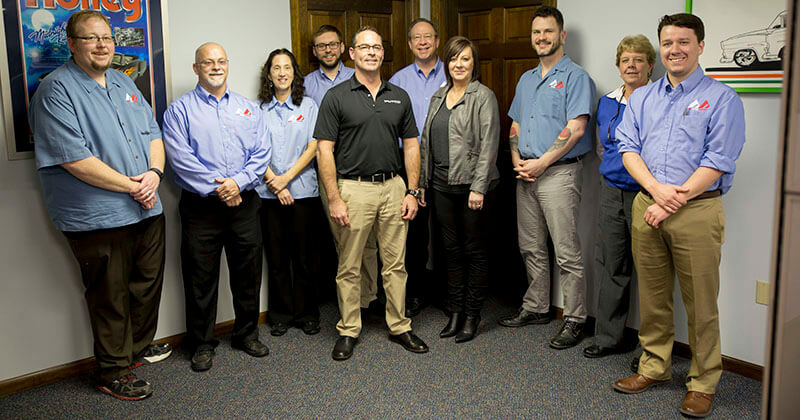 We love having these meetings because they give us the chance to connect people with people, from warehouse distributors and manufacturers to all of us here at headquarters and our nationwide network of aftermarket jobbers. Thanks for coming out to see us, Tom: without the support of manufacturers like T-Rex, our program wouldn’t be possible! To give your truck a front end to envy, head on over to your local Total Truck Centers retailer and ask about a T-Rex grille. Find an affiliated store using our dealer locator. Known for its broad range of truck and SUV accessories, Putco is a giant in the truck aftermarket industry—and rightly so. From bed rails, grilles, and aesthetic trim to protective finishes and an astonishing selection of premium lighting, Putco has something for just about anyone wanting to set their pickup apart. That’s why Total Truck Centers was thrilled to have National Sales Manager Scott Majors and Western Regional Sales Manager Desia Anderson in house to talk shop and get a sneak peek at what’s coming down the pike on Putco’s production schedule. (Don’t ask, we can’t tell you…yet!) What we CAN say is that we have Putco down to shoot some In the Garage and AAM University videos next year, so you can look forward to detailed installations as well as some educational series straight from the horse’s mouth. Many thanks to Scott and Desia for taking the time to come out to see us. Without the support of manufacturers like Putco, our program wouldn’t be possible! To give your truck a full Putco makeover, head on over to your local Total Truck Centers retailer. Find an affiliated store using our dealer locator. Welcome to the 2015 SEMA Show! In this video series, we will show you the exciting new products that you can expect to see in 2016. <p>Welcome to the 2015 SEMA Show! In this video series, we will show you the exciting new products that you can expect to see in 2016. Go Rhino’s BR5 Front Bumper Replacement for the 2015-2016 Ford F-150 features a welded-steel, two-piece design (bumper shell and mounting plate/winch tray) for use with winches up to 12,500 pounds. This product includes integrated light ports and heavy-duty D-shackle mounts that fit directly to the frame rails for extra strength. The BR5 features a durable black, textured, powder-coated finish and is backed by a 5-year warranty. BR5 Bumper Shell, Brackets, and Mounting Plate/Winch Tray ship together as one part number. 1-inch steel D-shackle mounting clevis welded directly to the mounting plate/winch tray (shackles not included). Optional light bar provides extra protection and multiple light mounting options. Framed mesh vent cover hides mounting bracket while allowing critical airflow to vehicle. Functional, removable steel mesh covers add protected airflow to the winch. Optional 3″x 3″ light mounts (sold separately). Frame mounted for optimal strength. Will fit 2- and 4-wheel-drive models. Excludes models with Active Park Assist and Adaptive Cruise Control. Protect those expensive lights from impact with this 10-piece Rugged Ridge Euro Guard black metal kit. These guards look as good as they perform. Each black powder-coated metal guard easily installs to factory mounting points, providing a great look and protection from low-hanging trail obstacles. 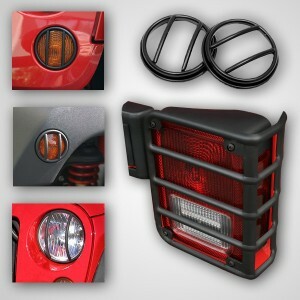 Each kit includes guards for headlights, parking lights, side marker lights, factory fog lights, and rear tail lights. This kit will fit both 2- and 4-door 07-16 Jeep Wrangler models with factory installed bumper-mounted fog lamps. *Will NOT fit Sahara and Moab editions.